Bundle up, Lake County! Like the weird uncle, old man winter has joined the gathering far too early. Thankfully, for those not acclimated to the bitter chill, the top things to do this weekend November 16-18 are largely held indoors, or they’ll be so much fun that you won’t even realize you’re nearly frozen. The holiday season is in our midst and any good Illinoisan knows it’s not a complete season without their town’s annual tree/menorah lighting. Click here for the list of Tree Lightings in Lake County. “But Thanksgiving comes first!” you say. To which I reply, “correct.” There are plenty of excellent Turkey Day events around the county as well. See our list of Lake County Turkey Trots for example. There’s nothing like burning off part of the feast before you even pick up the fork! For all other events and activities happening this weekend, continue here. Add an extra spoonful of whipped cream to your hot cocoa and continue reading for the top things to do this weekend November 16-18. Naughty or nice, it isn’t too late to persuade the jolly big man which list you should make. Kris Kringle and his helpers will slide down the chimney of Gurnee Mills for several evenings of meet and greets with the man in the red suit. The Gurnee shopping center’s event gives children an opportunity to plead their case for the nice list, and to take a photo with Mr. Claus himself. It’s Santa Photo Time runs on various dates through December 24. Visit gurneemills.com to learn more. To visit Santa, you can enter Gurnee Mills through Entry E.
Friday-Sunday, November 16-18; Fri.: 11 a.m.-8 p.m. Sat. : 10 a.m.-8 p.m., Sun. : Noon-6 p.m. Free admission. Gurnee Mills, 6170 W. Grand Ave., Gurnee. Members Only area! So romantic ❤️ Relaxing this Saturday before another week of studio art making! Getting in the zone next week to create more and more for upcoming events! Close your eyes and make a wish. Lynfred Winery is turning a decade old over the weekend and they need your help to blow out the candles. The Wheeling winery will sell their celebratory sparkling wines for discounted prices to commemorate their anniversary throughout the weekend. Don’t forget to take a home a few bottles of the November Lake County Libation Trail Libation of the Month: the Christmas Red Spiced wine. Raise your glass and cheers to Lynfred! Friday-Sunday, November 16-18; Fri. and Sat. : 11 a.m.-8 p.m. Sun. : 11 a.m.-7 p.m. Free admission. Lynfred Winery Wheeling, 971 N. Milwaukee Ave., Wheeling. Lake Forest’s Citadel Theatre raises its curtains to this year’s holiday musical, “Joseph and the Amazing Technicolor Dreamcoat.” The musical created by Tim Rice and Andrew Lloyd Webber turns half a century old this year. A story based on the Bible’s Book of Genesis, Joseph received a coat from his father, Jacob. This gaudy garb filled Joseph’s 11 brothers with jealousy because the coat symbolized that the show’s protagonist would assume administrative control of the family. His outraged siblings ultimately fail in an assassination attempt, so they sell him into slavery to the Egyptians. See how Joseph overcomes his adversity in the classic holiday hit. “Joseph and the Amazing Technicolor Dreamcoat” runs on select days through December 23. Friday-Sunday, November 16-18; Fri. and Sat. 8 p.m., Sun. : 3 p.m. Admission: $45. Citadel Theatre, 300 S. Waukegan Rd., Lake Forest. 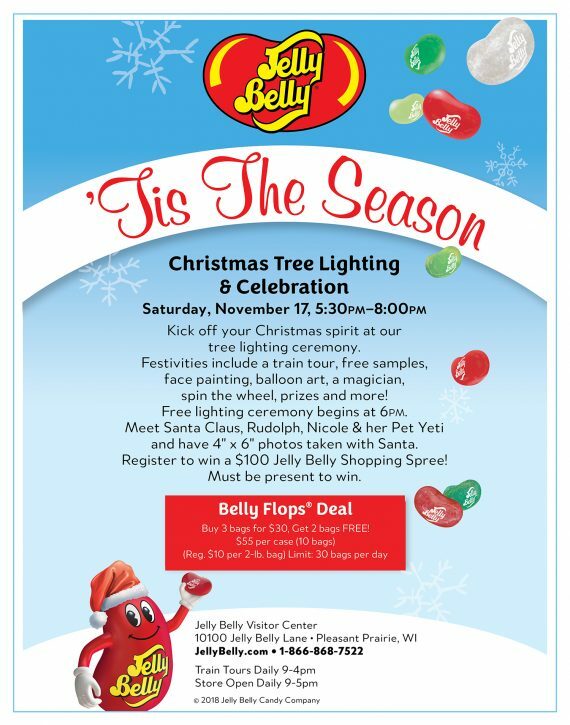 Kick-start the holiday season with the “sweetest” tree lighting ceremony and celebration at the Jelly Belly Welcome Center and Factory. Meet and greet Jolly Old St. Nicolas and his renowned red-nosed reindeer as the newly lit tree illuminates the sky. The Pleasant Prairie event gives children the opportunity to take their photo with Santa Claus and reveal to the Jolly North Pole resident their holiday wish-list. The candy factory festival is highlighted by discounts on their famed “Belly Flops,” a shopping spree raffle and more. Saturday, November 17; 5:30-8 p.m. Free admission. Jelly Belly Visitor Center, 10100 Jelly Belly Ln., Pleasant Prairie, WI. Antique aficionados and retro-machine lovers should head to Lake County Fairgrounds and Event Center for a can’t-miss show this weekend. The massive Grayslake facility welcomes the Chicagoland Antique Advertising, Slot Machine and Jukebox Show to the expansive 65,000 square-foot venue. Attendees will browse through various unique items like penny arcade machines, music boxes, popcorn machines, carnival games, gas pumps, phone booths, neon signs, pedal cars, vinyl records and more. Visit chicagolandshow.com for more information. Friday-Sunday, November 16-18; Fri: 7 a.m.-5 p.m. Sat. : 9:30 a.m.-5 p.m. Sun. : 9 a.m.-2:30 p.m. Admission: $7. Lake County Fairgrounds and Event Center, 1060 E. Peterson Rd., Grayslake. For all other events and activities happening this weekend November 16-18, continue here.